The invention of electrocardiography has had an immeasurable impact on the field of cardiology. 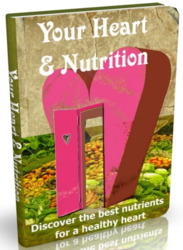 It has provided insights into the structure and function of both healthy and diseased hearts. The ECG has evolved into a powerful diagnostic tool for heart disease, especially for the detection of arrhythmias and acute myocardial infarction. The use of the ECG has become a standard of care in cardiology, and new advances using this technology are continually introduced. The discovery of intrinsic electrical activity of the heart can be traced to as early as the 1840s. Specifically, in 1842, the Italian physicist Carlo Matteucci first reported that an electrical current accompanies each heartbeat. Soon after, the German physiologist Emil DuBois-Reymond described the first action potential that accompanies muscle contraction. Additionally, Rudolph von Koelliker and Heinrich Miller recorded the first cardiac action potential using a galvanometer in 1856. Fig. 11. Willem Einthoven's string galvanometer consisted of a massive electromagnet with a thin, silver-coated string stretched across it. Electric currents passing through the string caused it to move from side to side in the magnetic field generated by the electromagnet. The oscillations in the string provided information on the strength and direction of the electrical current. The deflections of the string were then magnified using a projecting microscope and recorded on a moving photographic plate. Courtesy of the NASPE-Heart Rhythm Society History Project. observed through a microscope. Using this capillary electrometer, Waller was the first to show that the electrical activity precedes the mechanical contraction of the heart. He was also the first to show that the electrical activity of the heart can be seen by applying electrodes to both hands or to one hand and one foot; this was the first description of "limb leads." Interestingly, Waller would often publicly demonstrate this with his dog, Jimmy, who would stand in jars of saline during the recording of the ECG. One of the next major breakthroughs in electrocardiography came with the invention of the string galvanometer by Willem Einthoven in 1901. The following year, he reported the first electrocardiogram, which used his string galvanometer. Ein-thoven's string galvanometer consisted of a massive electromagnet with a thin, silver-coated string stretched across it. Electric currents that passed through the string would cause it to move from side to side in the magnetic field generated by the electromagnet. The oscillations in the string would give information regarding the strength and direction of the electrical current. 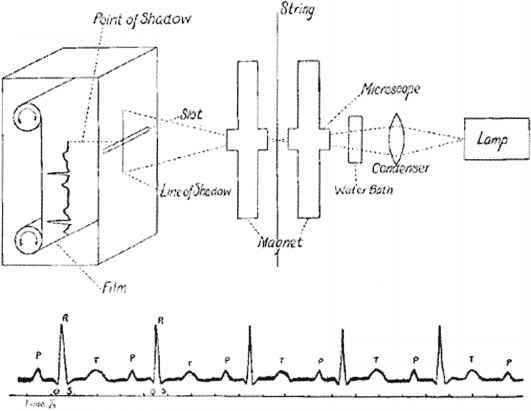 The deflections of the string were magnified using a projecting microscope and were recorded on a moving photographic plate (Fig. 11). Years earlier, utilizing recordings from a capillary electrometer, Einthoven was also the first to label the deflections of the heart's electrical activity as P, Q, R, S, and T.
In 1912, Einthoven made another major contribution to the field of electrophysiology by deriving a mathematical relationship between the direction and size of the deflections recorded by the three limb leads. This hypothesis is known as Einthoven's triangle (described in Section 3.1). The standard 3 limb leads were used for three decades before Frank Wilson described unipolar leads and the precordial lead configuration. The 12-lead ECG configuration used today consists of the standard limb leads from Einthoven and the precordial and unipolar limb leads based on Wilson's work. 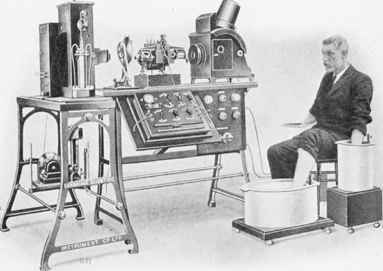 Following Einthoven's invention of the string galvanometer, electrocardiography quickly became a research tool for both physiologists and cardiologists. Much of the current knowledge involving arrhythmias was developed using the ECG. In 1906, Einthoven published the first results of ECG tracings of atrial fibrillation, atrial flutter, ventricular premature contractions, ventricular bigeminy, atrial enlargement, and induced heart block in a dog. Einthoven was awarded the Nobel Prize for his work and inventions in 1924. Thomas Lewis was one of the pioneering cardiologists who utilized the capabilities of the ECG to further scientific knowledge of arrhythmias. 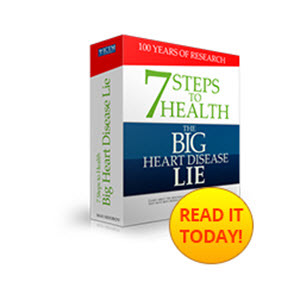 His findings were summarized in his books The Mechanism of the Heart Beat and Clinical Disorders of the Heart Beat, published in 1911 and 1912, respectively. He also published over 100 research papers describing his work. Interestingly, Lewis was also the first to use the terms sinoatrial node, pacemaker, premature contractions, paroxysmal tachycardia, and atrial fibrillation. For more information on arrhythmias, see Chapter 22. Fig. 12. A diagram of Cambridge Scientific Instrument Company's smaller version of the string galvanometer and electrocardiogram of a normal rhythm. Reprinted courtesy of the NASPE-Heart Rhythm Society History Project. use of the exercise electrocardiographic stress test. Their use of exercise for ECG analyses stemmed from the observation that many of their patients experienced angina during physical exertion. This technique was not routinely used, however, because it was thought to be very dangerous. Nevertheless, with these advances in protocols and technologies, the ECG emerged as a common diagnostic tool for physicians. ECG equipment has come a long way since Einthoven's string galvanometer. Yet, Cambridge Scientific Instrument Company (United Kingdom) was the first to manufacture this instrument back in 1905. It was massive, weighing in at 600 pounds. A telephone cable was used to transmit the electrical signals from a hospital over a mile away to Einthoven's laboratory. A few years later, Max Edelman of Cambridge Scientific Instrument Company manufactured a smaller version of the instrument (Fig. 12). However, it was not until the 1920s that bedside machines became available. A few years later, a "portable" version was manufactured in which the instrument was contained in two wooden cases, each weighing close to 50 pounds. In 1935, the Sanborn Company (Andover, MA) manufactured an even smaller version of the unit that only weighed about 25 pounds. Fig. 13. 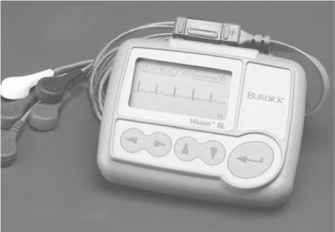 A version of the Holter monitor that is used currently. The one here is manufactured by Burdick, Inc. (Dearfield, WI). these signals via radio. Subsequent versions of such systems were dramatically reduced in size, but the next version utilized tape or digital recording of the signal. Today, miniaturized systems (Fig. 13) allow patients to be monitored over longer periods of time (usually 24 h) to help diagnose any problems with rhythm or ischemic heart disease. Fig. 14. A loop recorder with pacemaker and detection capabilities is shown. This model is manufactured by LifeWatch Inc. (Buffalo Grove, IL). Fig. 15. A loop recorder. 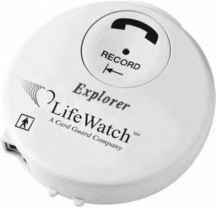 The one pictured here is manufactured by LifeWatch, Inc. The use of computers for the analysis of ECGs began in the 1960s. In 1961, Hubert Pipberger described the first computer analysis of ECG signals, an analysis that recognized abnormal records. Computer-assisted ECG analyses were introduced into the clinical setting in the 1970s. The use of computers, microcomputers, and microelectronic circuits has had a huge impact on electrocardiography. The size of the equipment has been drastically reduced to pocket size or even smaller for some applications. Computer programs can also provide summaries of information recorded from the ECG, including heart rates, heart rate variability, multiple types of arrhythmias, and variations in QRS, ST, QT, or T patterns. This has allowed continuous monitoring of patients over much longer time periods, which can greatly help in the diagnosis of patients with infrequent symptoms. However, there are some concerns that have surfaced with the use of computers for ECG analyses, including decreased basic training in the interpretations of ECGs and a reduction in the detection of new pattern changes associated with different disease states. Fig. 16. The Reveal, an implantable electrocardiogram loop recorder, manufactured by Medtronic, Inc., Minneapolis, MN. recorders, like the Holter monitor described earlier, are attached to the surface of the body and continuously record signals for a predetermined duration. Most such systems record from at least three different ECG leads. When using this method, patients must record their daily activities and the time of the onset of symptoms. Event recorders are another type of instrument used for ECG collection. There are two basic types of event recorders: a postevent recorder (worn continuously and self-activating when cardiac symptoms appear) and a miniature solid-state recorder (placed on the precordium to record the rhythm when symptoms appear). Today, these devices can be as small as a credit card. A second type of event recorder available is the preevent recorder. Such devices are similar to those used for postevent recorders, but a memory loop is used to enable the recording of information several minutes before and after the onset of symptoms. Some examples of loop recorders are shown in Figs. 14 and 15. The Reveal™, a miniature version of a preevent recorder that can be implanted subcutaneously, is currently available and is shown in Fig. 16 (Usinoatrial, Medtronic Inc., Minneapolis, MN). 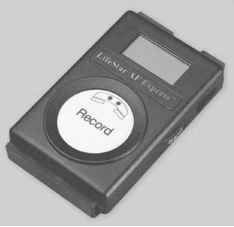 This device is used for patients who elicit infrequent symptoms (hence, they remain undiagnosed) and for those in whom external recorders are considered impractical. The third type of ECG instrument that is used is a real-time monitoring system. With this type of instrument, the data are not recorded within the device, but are transmitted transtele-phonically to a distal recording station. Such instruments are commonly used for monitoring patients who have a potentially dangerous condition so the technician can quickly identify the rhythm abnormality and make arrangements for proper management of the condition.